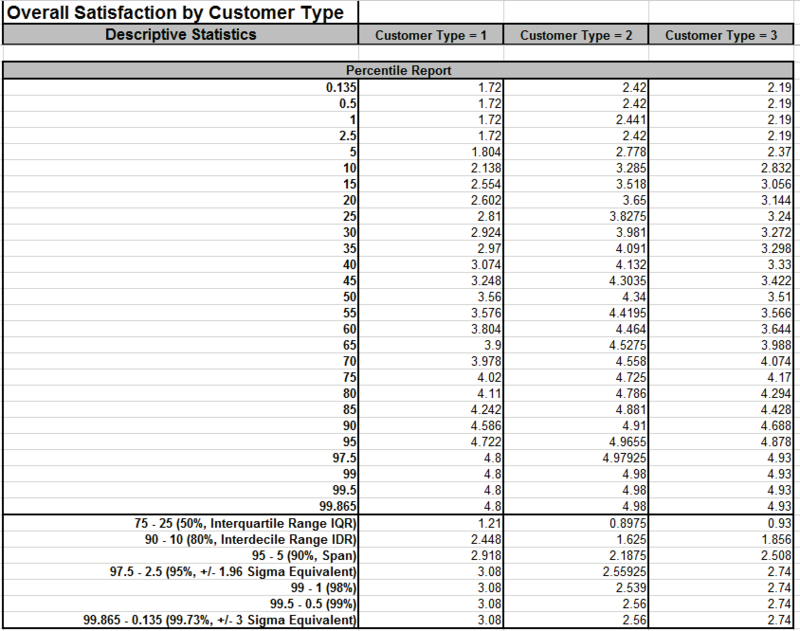 How Do I Display Descriptive Statistics in Excel Using SigmaXL? 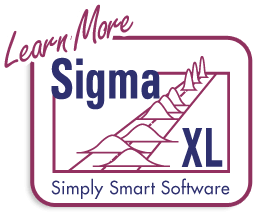 Open Customer Data.xlsx (to access, click SigmaXL > Help > Open Help Data Set Folder or Start > Programs > SigmaXL > Sample Data). Click Sheet 1 Tab. 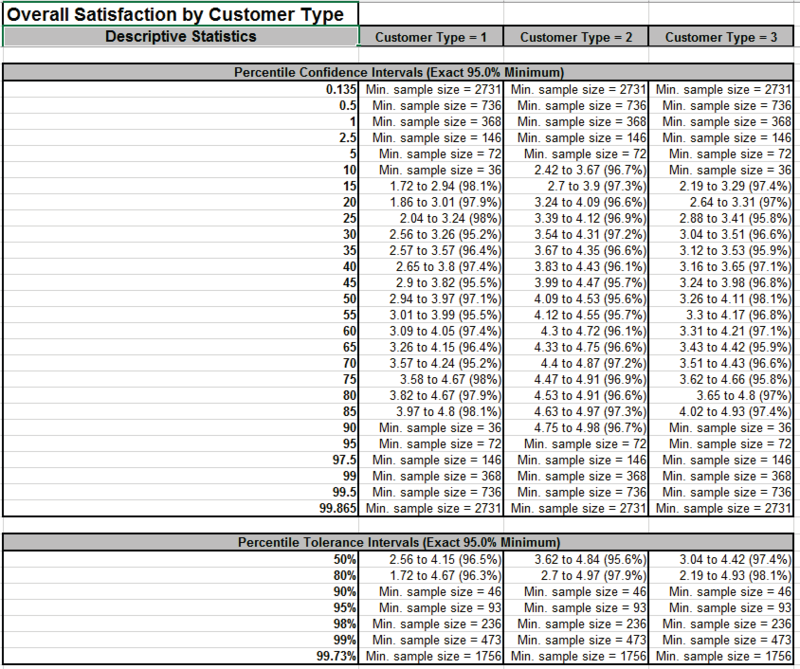 Which Customer Type has the highest mean satisfaction score? Clearly Type 2. However, we have to be careful concluding that there is a significant difference in satisfaction solely by looking at the Means. 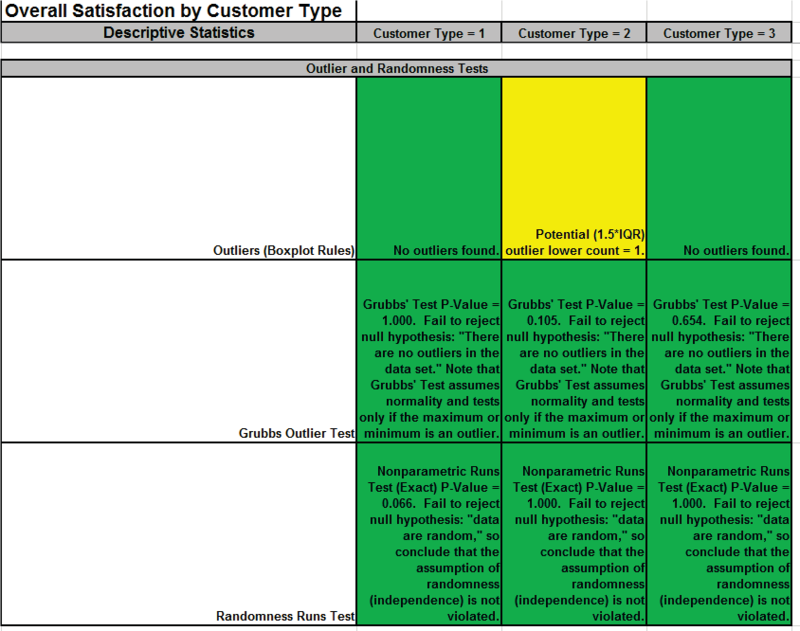 In the Analyze Phase, we will run tests of hypothesis to validate that Type 2 Customers are, in fact, significantly more satisfied. Tip: Click on Column B, click Window > Split, Window > Freeze Panes (Excel 2007/2010: View | Window | Split, Freeze Panes). 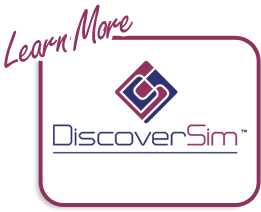 This freezes Column A and allows you to scroll across the Descriptive Statistics for each level of the Group Category. This is particularly beneficial when there are a large number of columns. Tip: Select only those options that are of interest in order to minimize the size of the report. tendency in the presence of outliers. This is a popular alternative to Anderson Darling. 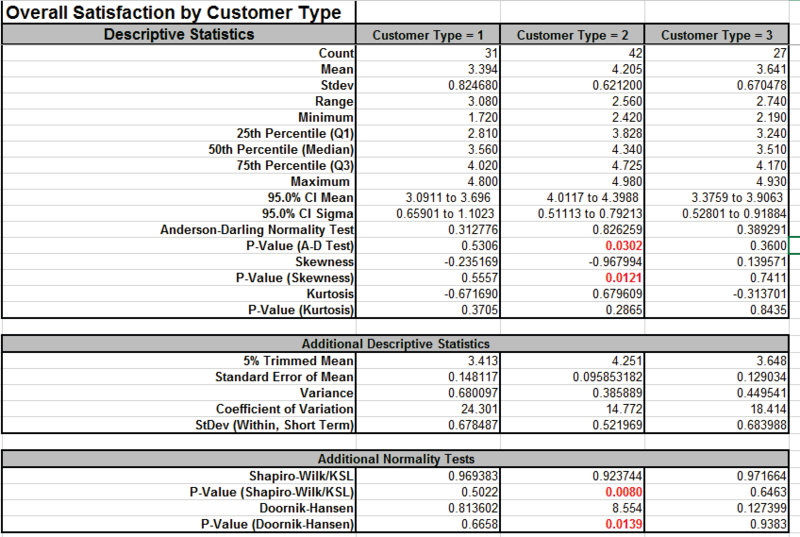 test is used in Correlation Matrix to test bivariate normality). 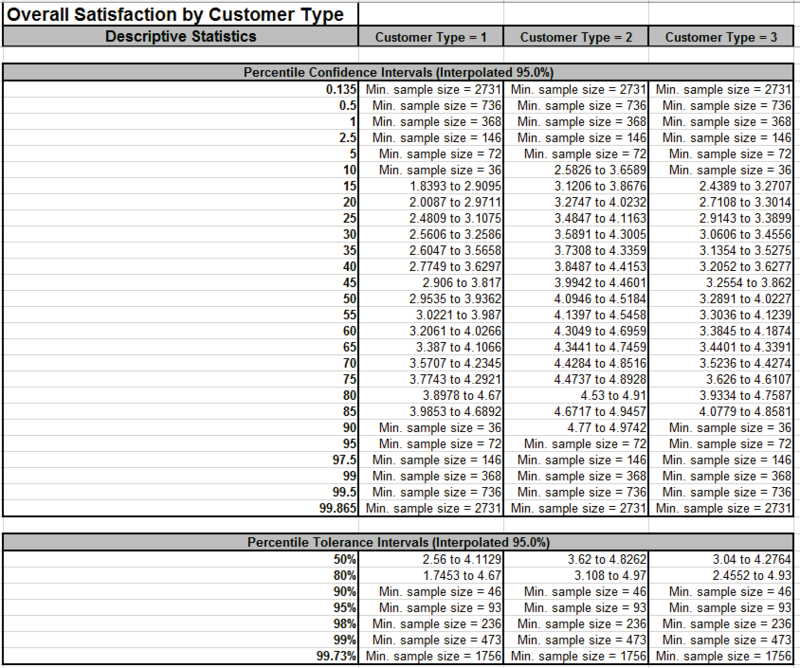 The Percentile Report gives 27 values from 0.135 to 99.865. The Percentile Confidence Intervals give 27 values from 0.135 to 99.865. 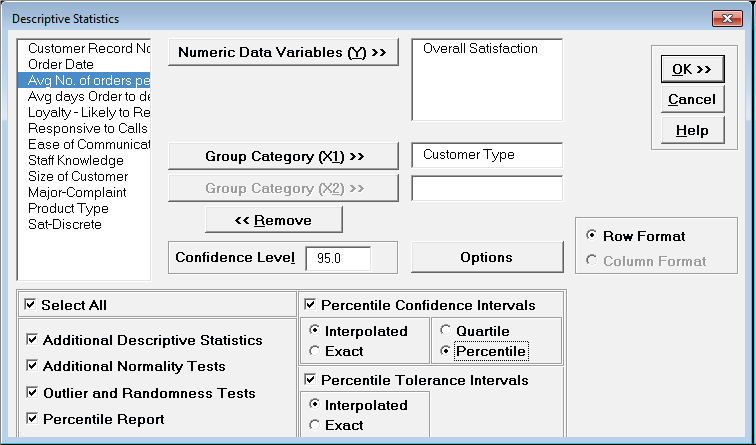 The Quartile Confidence Intervals give 3 values: 25, 50 and 75. The Percentile Tolerance Intervals are 50%, 80%, 90%, 95%, 98%, 99%, and 99.73%. Confidence and Tolerance Intervals for further details. size, a minimum sample size is reported. assumes that the remainder of the data are normally distributed. The Randomness Runs Test is a nonparametric exact runs test. 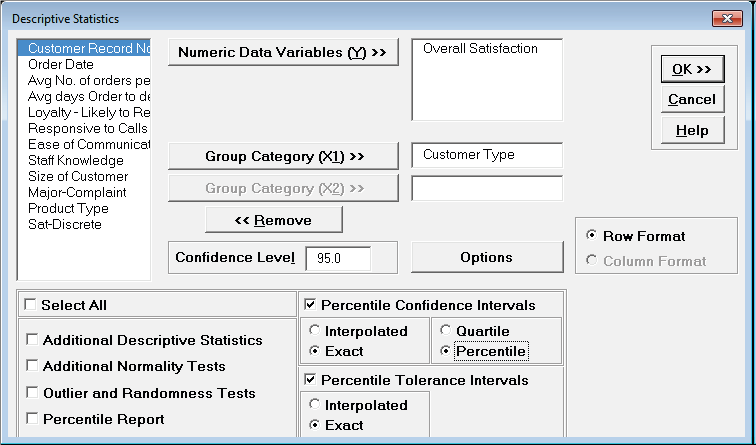 automatic assumptions report that are included in t-tests and ANOVA.